Universal acclaim - based on 32 Critics What's this? Summary: Former superhero Jessica Jones (Krysten Ritter) has opened a detective agency called Alias Investigations and meets Luke Cage (Mike Colter) on one of her cases as a man (David Tennant) from her past resurfaces. On its surface, Jessica Jones is well-executed on the level we've come to expect from Netflix-produced series, featuring a top-notch cast, solid writing and great use of its New York location to invoke both classic noir and '70s cinema.... But there's something really extraordinary about this show, and it comes down to Kilgrave. Man, woman, gay, straight, black, white--every character has layers. Everyone has complications. Given the otherworldly circumstances, it all moves along quite logically and at a brisk pace that leaves dawdling for dead. There’s no flabby midsection here, just one major development after another. The fight scenes are well-choreographed and frequent. And the twists are imaginative while also being grounded in the grim realities of this ramped-up universe. It’s a complex protagonist, the kind we don’t see enough of on television or in studio films.... This series feels like the first superhero show really just for grown-ups--and it totally works. There’s a tricky balancing act going on--crossing a moody detective show with both a comic action thriller and a woman-in-peril psychological drama--but Ms. Rosenberg proves to be mostly up to the task. Jessica Jones could use a bit more wit, overall. But its messed-up, tough, brave heroine holds our interest every moment. The series isn’t perfect. To be honest, it drags a bit and seems repetitive, as though Rosenberg is stretching things out to increase audience tension. In fact, you’re likely to feel the opposite from time to time, a desire to say, “oh, get on with it.” But stick with it. This has been my favorite show for a while. 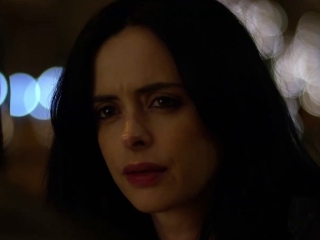 Although I might be in a minority I liked Jessica Jones more than Season 1 of daredevil. I thinkThis has been my favorite show for a while. 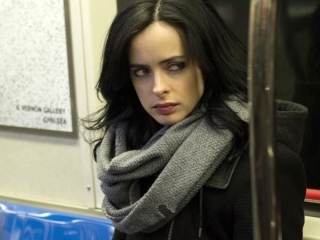 Although I might be in a minority I liked Jessica Jones more than Season 1 of daredevil. I think the truly standout part of this show is the villain. Easily the best written/acted villain in any Marvel movie/show. There are moments were David Tennant really makes you feel sympathy for the devil. There's a really good show trapped somewhere within Jessica Jones, which unfortunately couldn't get out due to several glaring issues. 1.There's a really good show trapped somewhere within Jessica Jones, which unfortunately couldn't get out due to several glaring issues. 1. Apparently, the writers think that the audience won't understand who Jessica is, so they have other characters constantly describing her for us ("freak", "you're not normal", "you use sarcasm to deflect", etc.). 2. It's an 8 episode storyline stretched to 13. Mostly with countless unearned subplots about characters that are completely pointless in the grand scheme of things. 3. Mike Colter as Luke Cage is another perfect casting in the MCU, but his presence feels like an afterthought to please the comic book fans. 4. Jessica's powers weren't well translated, since they're always portrayed with dodgy editing to disguise the lack of budget. 5. The conflict was solved very easily, and therefore, didn't feel cathartic. But to be fair, there are some elements that deserve praise. Krysten Ritter is great (she's a more understated version of Eva Green), David Tennant chewing massive chunks of scenery is a lot of fun, and the show treats sexual abuse in a way that doesn't feel exploitative (I'm looking at you Game of Thrones). Find details on all of the notable TV premieres coming this spring, from returning favorites like The Handmaid's Tale, Westworld, The Americans, and Legion to newcomers such as Trust, Krypton, The Terror, and Barry.